Upgrade your computer with the Intel Xeon X5355 quad-core processor and experience high-end performance. With a clock speed of 2.66 GHz, this Intel processor manages and executes demanding system tasks efficiently. Furthermore, this quad-core processor features Intel Virtualization technology (VT-x) that makes the system more flexible, manageable, and offers additional security against harmful threats. Also, the Intel SpeedStep technology improves the Intel Xeon X5355 processor’s efficiency and helps in conserving energy. Moreover, the Intel 64 architecture of this Intel processor allows you to address over 4 GB of data. So, if you are looking for a processor to satisfy all your requirements, then this processor is the ideal choice. Core i7 Extreme 1st Gen.
Upgraded my old quad core Mac pro 1,1 with these and it has doubled the performance. Coupled with 28gb of ram and an ati radeon 5770. Also upgraded the OS to El capitan. Now I can delay upgrading to latest technology. We opted to upgrade all of our Mac Pro 1,1s to these CPUs and they run Great! We installed El capitan and now these systems work on par with a good Quad i5, but we have the expansion slots for awesome video cards and other peripherals! Good product if you can find it at a reasonable price. Bought these because I wanted a few more cores to support running more virtual machines on my server at the colo (data center). The Woodcrest 5160 CPUs I had were fine, but the X5355 let me go from 4 cores to 8 in the same server, and more cores offset the slight loss of clock speed. Unfortunately HP never updated the BIOS to support the 54xx Harpertown CPUs, even thought the chipset supports it, so finding these X5355 Clovertowns at a reasonable price was my best option. Great value way to improve performance of early Mac Pros (2006 models)! 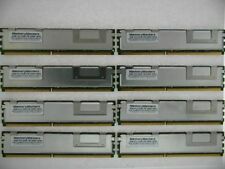 I got a pair of these to replace standard processors in a MacPro 1,1 - which is designed to allow the processors to be upgraded. There are several "how to do this" reports on the web, and the upgrade itself was pretty easy to do. And the results completely as expected - CPU performance roughly doubled (Geekbench went from 5400 to 10221). The processors cost a fortune 'new' but there are many around from refurbished cpu shops, and the prices on these are pretty good currently.